This data set provides the spatial distributions of vegetation types, geobotanical characteristics, and physiographic features for the Arctic tundra region of Alaska for the period 1993-2005. Specific attributes include dominant vegetation, bioclimate subzones, floristic subprovinces, landscape types, lake coverage, and substrate chemistry. This data set generally includes areas North and West of the forest boundary and excludes areas that have a boreal flora such as the Aleutian Islands and alpine tundra regions south of treeline. The products included with this data set were developed from the Circumpolar Arctic Vegetation Map (CAVM), an international effort to map the vegetation and associated characteristics of the circumpolar region using a common base map (Raynolds et al., 2005). The map expands on the Alaska portion of the Circumpolar Arctic Vegetation Map (Walker and Raynolds, 2016). This data set is distributed as 10 data files. This includes seven compressed directories (*.zip) containing shapefiles and three files in GeoTIFF (*.tif) format. Figure 1. Arctic Alaska Tundra vegetation map (Raynolds et al., 2006). This data set provides the spatial distributions of vegetation types, geobotanical characteristics, and physiographic features for the Arctic Tundra region of Alaska. Specific attributes include dominant vegetation, bioclimate subzones, floristic subprovinces, landscape types, lake coverage, and substrate chemistry data. The products included with this data set were developed from the Circumpolar Arctic Vegetation Map (CAVM), an international effort to map the vegetation and associated characteristics of the circumpolar region using a common base map (Raynolds et al., 2005). The Arctic-Boreal Vulnerability Experiment (ABoVE) is a NASA Terrestrial Ecology Program field campaign that takes place in Alaska and western Canada between 2016 and 2021. Climate change in the Arctic and Boreal region is unfolding faster than anywhere else on Earth. ABoVE seeks a better understanding of the vulnerability and resilience of ecosystems and society to this changing environment. This data set is distributed as 10 data files: seven compressed directories (*.zip) containing shapefiles (*.shp) and three files in GeoTIFF (*.tif) format. These data are a subset of the CAVM, expanded for the state of Alaska. The shapefiles and their descriptions are listed in the Table 1. The attribute descriptions of the individual shapefiles are listed in separate tables. The shapefile data are also provided as companion files in .kmz format for visualization in Google Earth. These files provide the distributions of various features in the the Arctic Tundra within Alaska in *.shp format. The *.zip files contain the .shp, .shx, .dbf, .prj files, that support the shapefile and a .lyr file. Some of the files also contain additional files such as .sbn or .sbx (spatial index files). All shapefiles are stored in the GCS_WGS_1984 geographic coordinate system and Lambert Azimuthal Equal Area projection. aga_arctic_ak_geobotanical.shp Contains seven attributes: ZONE, PHYTO, CHEM, LAKEPIXCAT, LANDSCAPE, PHYSIOG, COMM. A layer file for each attribute is zipped with this shapefile. aga_arctic_ak_lake_cover_2005.shp Lake cover based on the number of AVHRR water pixels in each mapped polygon, divided by the number of pixels in the polygon; pixels within 2 km of the coastline were excluded to avoid ocean water. G3.2. Moist nonacidic tundra (St. Lawrence I. The three GeoTIFF (.tif) files along with their descriptions are listed in Table 10. All the GeoTIFF files are in WGS84 datum with map units in meters. The spatial attributes of each of the GeoTIFF files are listed in Table 12.
aga_arctic_ak_avhrr_ndvi_1995.tif NDVI calculated from Channel 1 and Channel 2 data. Pixel values are a maximum NDVI value composite from 1 April to 31 October 1993 and 1995. This is a subset for Alaska. aga_arctic_ak_avhrr_cir_1995.tif Advanced Very High Resolution Radiometer (AVHRR) Channel 1 and Channel 2 data, displayed as false color-infrared. Pixel values are a maximum NDVI value composite from 11 July to 30 August 1993 and 1995. This is a subset for Alaska. ak_topo_aa.tif Topographic/elevation data for Alaska. These data would be useful to land-use and climate change applications. The products included with this data set are subsets and enhancements for Alaska from the Circumpolar Arctic Vegetation Map (CAVM), an international effort to map the vegetation and associated characteristics of the circumpolar region using a common base map (Raynolds et al., 2005). The CAVM used the approach of the Panarctic Flora (PAF) initiative (Elvebakk et al., 1999) which considered the Arctic to be equivalent to the five Arctic Bioclimate Zones, where Subzone A is the coldest and most barren subzone, and Subzone E is the warmest and most lushly vegetated. In Alaska, there are three bioclimate subzones (Subzones C, D and E), with southern boundaries corresponding approximately to mean July temperatures of 7, 9 and 12 degrees C, respectively. The two colder subzones (A and B) do not occur in Alaska. After the base map was established with the bioclimate subzones, additional geobotanical features were examined including the floristic features, elevation and landscapes, lake cover, and substrate pH. Look-up tables of dominant plant community types were made for most regions of the CAVM map based on the vegetation literature from each region. Floristic regions are east-west circumpolar subdivisions, based on the floristic provinces of Yurtsev (1994). There are three floristic provinces in Alaska: Northern Alaska, Beringian Alaska, and North Beringian Islands. There were four tables for Alaska, one for each of the Alaska floristic provinces and an additional table for Southwestern Alaska. These tables could not be used directly as a legend, because there was redundancy between the tables and many of the communities occurred in patches smaller than the minimum mapping unit (10 km2). Less common communities, such as those occurring on snowbeds and streamsides, were useful in describing the range of plant communities occurring in a polygon, but were not the dominant community mapped for a polygon. Tables were combined and original community descriptions from the literature were compared. If the community descriptions from two sources were similar and included similar dominant plant species, they were combined into one description with two literature citations. If two community descriptions had small differences, their appearance on the CAVM base image was checked. If the communities could be distinguished on the image, they were mapped separately; if they could not, they were mapped as the same unit, with both community descriptions included in the table. In practice, most of the polygon boundaries shown on the new map already existed in the CAVM data set. Some were not visible on the printed version of the map because adjacent polygons with similar physiognomy were mapped together when using the 15 units of the CAVM legend. These polygons could be coded differently using the 33 unit plant-community legend. In addition to re-coding existing CAVM polygons, the new map also included a few changes to polygon boundaries. Corrections were made to some polygon locations in the eastern Brooks Range to improve the map’s registration at the larger scale and on Nunivak Island to include information from additional studies. Data were compiled on the wetland plant communities in Southwestern Alaska, so that polygon boundaries could be added to subdivide the largest polygon on the CAVM map of Alaska, the wetlands of the Yukon-Kuskokwim Delta (Raynolds et al., 2005). This section provides additional information pertaining to the geobotanical attributes provided in each data file. aga_arctic_ak_vegetation_2005.zip: A shapefile-geoecological map of the Arctic Tundra within Alaska. It includes areas north and west of the forest boundary and excludes areas that have a boreal flora such as the Aleutian Islands and alpine tundra regions south of treeline. 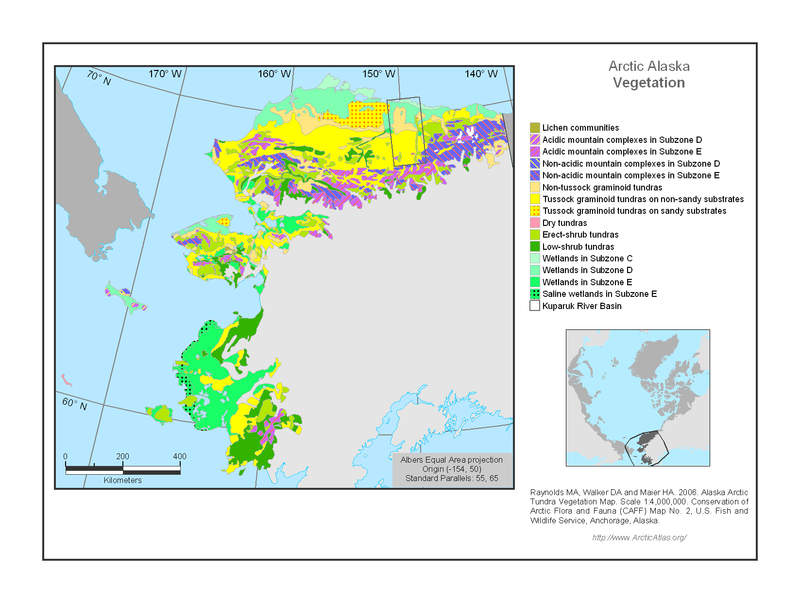 The map expands on the Alaska portion of the Circumpolar Arctic Vegetation Map. The major difference between the CAVM and this map is a numeric suffix that has been added to each map polygon code to provide more information about the dominant plant communities. This resulted in 33 map units that refer to physiognomic groups of plant communities on specific substrates or in different geographic regions of the map. The map was published at 1:4 million scale (Raynolds et al., 2006) and displays the vegetation using 33 map units (legend details: http://www.arcticatlas.org/maps/themes/ak/akvg). In several instances, the same or similar lists of plants occur with different numeric codes. This occurs because plant communities can span more than one bioclimate subzone, floristic province, or substrate type, and/or we could not find good information that would justify a unique name for the plant community. aga_arctic_ak_geobotanical.shp: The geobotanical map of Alaska. This map provides seven attributes. A layer file for each attribute is zipped with this shapefile. Individual shapefiles of these attributes are also provided and the attributes are defined in the Data Characteristics section (Section 2) of this document. COMM: Physiogonomic unit. There are there are 33 distinct physiogonomic unit codes. aga_arctic_ak_bioclimate_2005.shp: A shapefile of bioclimate subzones from A-E, where A is the coldest and E is the warmest. In order to characterize the transitions in vegetation that occur across the Arctic’s roughly 10 degrees C difference in mean July temperature, the approach of (Elvebakk et al., 1999) was adopted with some modification. Bioclimate subzones are north-south subdivisions of the Tundra Zone, based mainly on summer temperatures (Elvebakk et al. 1999). There are five bioclimate subzones, but only three bioclimate subzones in Alaska (Subzones C, D and E), with southern boundaries corresponding approximately to mean July temperatures of 7, 9 and 12 degrees C, respectively . The two colder subzones (A and B) do not occur in Alaska (Raynolds et al., 2005). aga_arctic_ak_floristic_2005.zip: A shapefile of the floristic sectors based on the PAF project (Elvebakk et al., 1999). The Arctic has a relatively consistent core of plant species that occur around the circumpolar region, but there is also considerable east to west variation in the regional floras, particularly in subzones C, D, and E. This variation is due to a number of factors, including different histories related to glaciations, land bridges, and north-south trending mountain ranges, primarily in Asia. These influences have restricted the exchange of species between parts of the Arctic. Russian geobotanists have described a set of floristic subdivisions based primarily on these floristic differences (Yurtsev 1994). Alaska is included within the Beringian Floristic Province, and includes three of the 23 circumpolar Sub-Provinces: North Beringian Islands, Beringian Alaska, and Northern Alaska (Yurtsev 1994, Walker 2005). The map was adapted from the PAF project (Elvebakk et al., 1999) based largely on Yurtsev’s approach. aga_arctic_ak_substrate_2005.zip: A shapefile depicting acidic areas, carbonate, and circumneutral areas. This product was derived from a wide variety of available sources including soil, surface-geology, and bedrock-geology maps, and from spectral patterns that could be recognized on the AVHRR base image. The pH values of the three categories were based on the field experience and hundreds of Arctic vegetation releve plots sampled by D.A. Walker on the North Slope and Seward Peninsula of Alaska, in consultation with F.J.A. Daniëls (Greenland) and N.G. Moskalenko (Yamal and Gydan Peninsulas, Russia). aga_arctic_ak_lake_cover_2005.zip: A shapefile of lake cover based on the number of AVHRR water pixels in each mapped polygon, divided by the number of pixels in the polygon. Since the imagery has a pixel size of 1 km^2, lake cover is underestimated for areas with many small lakes. Pixels within 2-km of the coastline were excluded to avoid ocean water. The percent cover data were grouped into six categories: < 2%, 2-10%, 10-25%, 25-50%, 50-75%, and 75-100%. aga_arctic_ak_avhrr_cir_1995.tif: This was the base map false color infrared (CIR) image derived from the AVHRR, a sensor on board the National Oceanic and Atmospheric Administration (NOAA) satellites. Advanced Very High Resolution Radiometer (AVHRR) data were obtained from the USGS Global AVHRR 10-day composite data. (http://edcdaac.usgs.gov/1KM/1kmhomepage.asp) (Markon et al 1995). This is a subset for Alaska of the original CAVM base map. Glaciers and oceans were masked out using information from the Digital Chart of the World (ESRI 1993). The image is composed of 1 x 1-km pixels. The color of each pixel was determined by its reflectance at the time of maximum greenness, selected from 10-day composite images from 11 July to 30 August 1993 and 1995. These intervals cover the vegetation green-up-to-senescence period during two relatively warm years when summer-snow cover was at a minimum in the Arctic. Maximum greenness was determined from the normalized difference vegetation index (NDVI). Vegetation greenness is calculated as: NDVI = (NIR - R) / (NIR + R), where NIR is the spectral reflectance in the AVHRR near-infrared channel (0.725-1.1 µ, channel 2) where light-reflectance from the plant canopy is dominant, and R is the reflectance in the red channel (0.58 to 0.68 µ, channel 1), the portion of the spectrum where chlorophyll absorbs maximally. The resulting image shows the Arctic with minimum snow and cloud cover. The channel 1 and channel 2 values were then stacked to create as a false-color CIR image (RGB = ch. 2, ch. 1, ch. 1). aga_arctic_ak_avhrr_ndvi_1995.tif: A GeoTIFF of NDVI from 11 July to 30 August 1993 and 1995. NDVI was calculated as: NDVI = (NIR - R) / (NIR + R), where NIR is the spectral reflectance in the AVHRR near-infrared channel (0.725-1.1 µm, channel 2) where light-reflectance from the plant canopy is dominant, and R is the reflectance in the red channel (0.5 to 0.68 µm, channel 1), the portion of the spectrum where chlorophyll absorbs maximally (Bhatt et al., 2010). Advanced Very High Resolution Radiometer (AVHRR) data were obtained from the USGS Global AVHRR 10-day composite data (http://earthexplorer.usgs.gov/). Glaciers and oceans were masked out using information from the Digital Chart of the World (ESRI 1993). The image is composed of 1 x 1-km pixels. The color of each pixel was determined by its reflectance at the time of maximum greenness, selected from 10-day composite images from 11 July to 30 August 1993 and 1995 (Markon et al., 1995). These intervals cover the vegetation green-up-to-senescence period during two relatively warm years when summer-snow cover was at a minimum in the Arctic (Markon et al., 1995). This is a subset for Alaska of the original CAVM NDVI map. ak_topo_aa.tif: A GeoTIFF of landform elevations for Alaska. Areas less than 100-m above sea level were separated to show low-level plains. Elevation above 100-m was divided into 333-m intervals to show decreases of about 2 degrees C as predicted by a lapse rate of 6 degrees C per 1000-m elevation. Elvebakk, A. 1999. Bioclimate delimitation and subdivisions of the Arctic. Pages 81-112 in I. Nordal and V. Y. Razzhivin, editors. The Species Concept in the High North - A Panarctic Flora Initiative. The Norwegian Academy of Science and Letters, Oslo. Raynolds, M.K., Walker, D.A., Maier, H.A. 2006. Alaska Arctic Tundra Vegetation Map. 1:4,000,000. U.S. Fish and Wildlife Service. Anchorage, AK.